A delicious and easy Gingerbread Men cookie recipe that highlights bold flavors of the Christmas season: ginger, cinnamon and cloves. 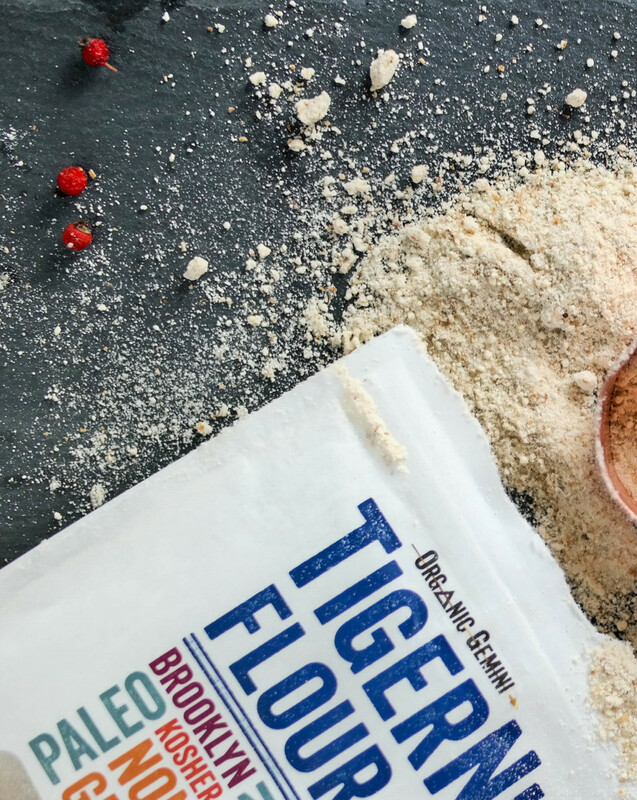 Made with tiger nut flour for a non-traditional twist. Sticky dough, riding merciless from one finger to the next, clustering into the other palm, was the helpless cookie making of my childhood Christmas Eve. The more I tried to pull this silly-putty of a dough off one hand, the more it stuck to the other. Never forming into a proper ball. But thankfully these are not those cookies. Those cookies were a thing of the Christmas Eve past. Da-do’s is what my grandparents called them. A mysteriously named Italian cookie and tradition that has no origin. All I know is that these cookies made an appearance every Christmas Eve. Making this year's cookie tradition less relentless, I chose a classic. The Gingerbread Man. But not too traditional as this recipe veers to the side of untraditional as the main ingredient is Organic Gemini's - Tiger Nut Flour. A flour sweet in all its profiles. Giving way to beautifully formed cookies unlike any I’ve seen with gluten free flours. The key is in the way its prepared. With delicate hands, as if you were holding a melting snowflake, fold the dough so that it crisscrosses into each other. With each fold, a sharp note of ginger hits the nose followed by an even more pungent case of molasses. These gingerbreads have a punch to the senses. Into the oven, soft dough firms and deepens in color with speckles of cinnamon and cloves spreading across its golden-maple shell. Out from the oven, with two hands protecting the cookie, a clean snap breaks it in two, reminiscent of a gingersnap but defiant in its form. Becoming two distinct cookies instead of one. These are the cookies of many Christmas Eve’s to come. A cookie so basic it’s sinister. One that houses all the fine spices of the holiday season and one that needs to be added to your seasonal baking repertoire. Scratch that – needs to be added to your year round baking repertoire. Perhaps not as a ginger man but at least served up in little circles. I’ve tried that too and it’s delicious. Start by preheating your oven to 350F and make the flax egg. Simply sift all the dry ingredients together in a large bowl. On low heat, melt the coconut oil in a saucepan and warm with the molasses. Then build a well into the dry ingredients and pour the wet ingredients inside, including the flax egg. Then slowly fold the dough together into a large ball. To roll and form the gingerbread men, first cut two large pieces of plastic wrap. Lay one on the bottom of a cutting board and plop the dough ball on top. Lay the second piece of plastic wrap on top. With a rolling pin (or can of beans) roll the dough into a very thin circle. I like my dough about 2cm thick. Remove the top wrapper and cut the dough using the cookie cutters. Take the cookies and place onto a lined baking sheet and cook for 8-10 minutes. Let cool and then top with any type of frosting you would like. Also top with fresh fruit and pecans for some fun crunch. I hope you enjoy this non-tradition take on these little men! Enjoy and be sure to tag 8thandlake on Instagram so I can see how you make your creations! #8thandlake.